I just couldn’t decide which pie to feature for Thanksgiving this year. The cheese pie recipe below was the very first pie I learned how to make, so it has a special place in my heart as a childhood favorite. 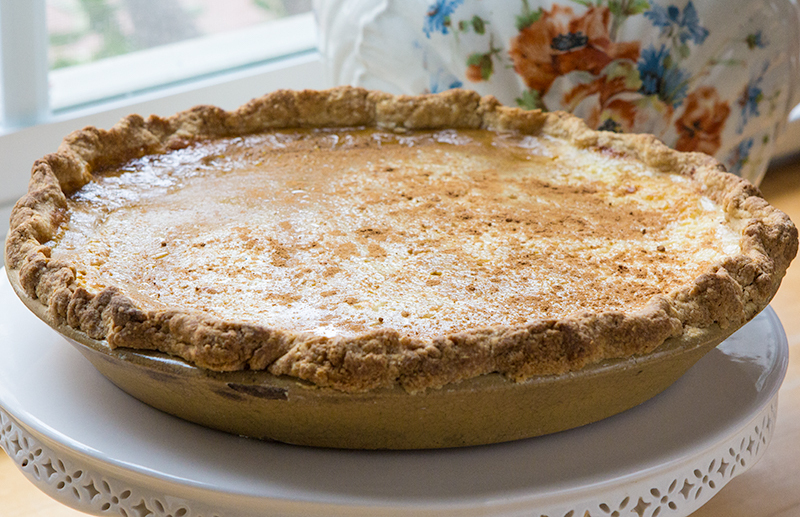 It’s an old Pennsylvania Dutch recipe, utterly sweet in its simplicity, but with extra richness from the pureed cottage cheese, – a bit like wrapping a custard pie in cashmere. I love it best very well chilled. Of course, it’s almost impossible to have Thanksgiving dinner without pumpkin pie. For some reason, it occurred to me that both fillings are similar in consistency and might really complement one another if I could figure out how to swirl them. Kind of silly, I know, but it actually worked. It’s visually beautiful and the flavors are wonderful together. The pie dough recipe is for one double-crusted pie or two 9-inch pies. If you have visited the mill and asked specifically about choosing the right Grist & Toll flour for pie dough, you likely learned the hard way (sorry!) that my opinion on that changes daily and that I have a tendency to over think and complicate some of the simpler baking recipes like pie dough. However, I do have some first hand miller and baker advice that seems to hold true across the board for all of my grains. Feel free to take it or leave it. Using a European style cultured butter definitely matters in the world of whole grains and pie dough. If you can find it, please use it. Many common supermarket butter brands have added a European style to their assortment, making them much more readily accessible. A couple of turns or folds really makes the dough more stable and easier to roll out. I know it’s counterintuitive, but stone milled whole grain flour can actually make very fragile pie dough. The extra turn or two seems to add some structure. Without doing this, I get a lot more tearing and separating while rolling out. Trust me, you don’t have to be afraid of overworking it. If you feel brave enough to try and swirl the two fillings, go for it! Otherwise, make these as individual pies and enjoy them just as much. I transferred half of each filling to separate liquid measuring cups which made the pouring more manageable, however, two smaller stainless steel or lightweight bowls will work just as well if you don’t have more than one liquid measuring cup. -In a large bowl, whisk together Sonora, sugar and salt. Add chilled butter cubes and cut in, using your fingers or a pastry blender, coating the flour well with the butter but leaving some pea-sized pieces of butter visible. Add the cider vinegar and water and mix until dough starts to come together. Pour the dough onto a lightly floured work surface. Press into a large disk. Wrap well and chill for 20-30 minutes. -Remove dough from refrigerator. Turn out onto a lightly floured work surface. Roll dough into a rectangle, roughly 6” x 15”. It’s okay if it looks a little shaggy at this point; it will continue to come together as you roll. Fold in thirds like a letter for an envelope. Use a plastic or metal bench scraper to neaten up the edges. Immediately roll again into a 6” x 18” rectangle and fold again. If the dough looks nice and cohesive, divide into 2 equal portions, gently shape into a round disc, wrap each in plastic wrap and refrigerate for at least another 30 minutes. *If the dough hasn’t quite come together, wrap in plastic wrap, refrigerate for another 30 minutes, then perform one more roll and fold. -Remove dough from refrigerator onto a lightly floured work surface. Roll into a circle that is roughly 2 inches wider than the pie pan you will be using. Lightly dust your rolling pin, work surface and top of dough round as needed to prevent sticking. Transfer dough to pie pan and press into place, starting from the bottom and easing up the sides of the pan, never pulling or stretching the dough (pulling and stretching may cause the dough to shrink as it bakes). Trim the edges and crimp. Cover with plastic wrap and refrigerate while making the filling(s). Preheat the oven to 375°F. Have ready a large baking sheet that will accommodate both pies. Make sure you blend the cottage cheese to a completely smooth consistency. You can do this in a blender or food processor. In a medium bowl, whisk together the sugar and flour. Add the blended cottage cheese and eggs and combine thoroughly. In a separate small bowl, whisk together the evaporated milk, whole milk, salt and vanilla. Add to cottage cheese mixture and whisk to blend. Either pour into one of the prepared crusts and sprinkle generously with cinnamon, or set aside while you mix the pumpkin filling. In a small bowl, thoroughly mix the brown sugar, cornstarch, salt, ginger, cinnamon, black pepper, nutmeg, and cloves. In a medium bowl whisk together the eggs, pumpkin puree and evaporated milk. Add the sugar and spice mixture to the pumpkin mixture and whisk to combine. Either pour into a chilled crust or prepare to swirl. Remove one of the chilled crusts and place on your work surface. Give each filling a good whisk to make sure the ingredients are still well incorporated and pour half of each into its own smaller vessel, like a liquid measuring cup or small lightweight bowl. I did this visually, guesstimating, but got it pretty darn close, about 2 ½ -3 cups of each filling. Better to ere on the side of too much filling in each pourer than too little, as you can always stop pouring if you’re getting too close to the top of the pie dough, but you won’t be able to easily add more filling later. Take a deep breath. Visually mark a center dividing line in your crust. Hold your two fillings equal distance above, about 8 inches will do, and aim to pour in the center of each half. Try to do it at the same rate. A little cross over and blending will happen, and it’s perfectly okay. Once you have filled your shell up to the fluted crust, use a butter knife or small narrow spatula to swirl the fillings a little more, making a zigzag like motion. Carefully transfer to your large baking sheet and repeat with the second crust. Sprinkle the obvious cheese pie portions with cinnamon. Carefully place in the oven and bake until outer edges of pies are firm, but the center still jiggles slightly, about 30-40 minutes. The pies will continue to firm up as they cool. Better to slightly underbake as overbaking will cause the custard fillings to curdle and become grainy. Remove from oven. Let cool to room temperature then cover with plastic wrap and chill.